Three robbers got more than they expected when an attempted burglary went horribly wrong resulting in their accomplice being shot dead by a woman staying at the Atlanta property. The two other raiders, who just managed to escape, are described as “armed and dangerous” and being hunted by police. Gwinnett County Police have released compelling footage of the moment three men brandishing firearms were caught breaking into a house in the early hours of September 16. CCTV video shows three men bursting through the front door in Spring Drive just before 4am. The group, with their faces uncovered, then appear to search the property. While the thieves gather in the front room of the house, an armed woman comes into the frame and starts firing. 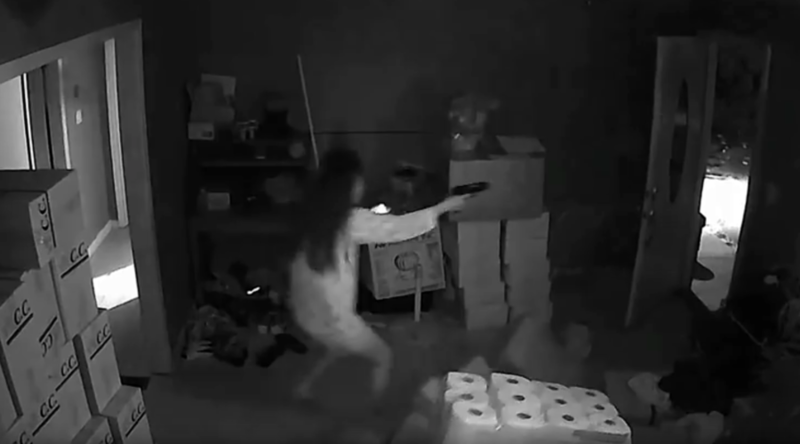 Clearly startled by the gun-wielding woman, the burglars exchange fire and desperately try to make their escape. In a bid to avoid the flying bullets, one of the intruders can be seen smashing through a glass door. Investigators have confirmed one of the men, 28-year-old Antonio Leeks, subsequently died in the driveway of the property from gunshot wounds. Identified as a local restaurant owner, the woman was a guest at the address and not the homeowner. According to a police statement, she armed herself after being woken by the sound of someone entering the property. The two remaining suspects are still being sought and investigators are hoping they can be identified through the in-house CCTV footage. A cash reward is being offered for their capture.